1. Capital of the province of Apamene, Syria; situated on the Orontes, south of Antioch. Like the other cities of Syria (Josephus, "B. J." vii. 3, § 3), Apamea probably had a large Jewish population, though there are no records extant as to the settlement of Jews there. According to Josephus ("B. J." i. 10, § 10), Antipater sent his sons to Apamea with soldiers to Julius Cæsar, who was hard pressed at the time. The rabbis considered Syria, and especially Apamea, as, in a certain degree, belonging to Palestine. Both the Jerusalem Targumim considered the city of Shepham (Num. xxxiv. 11), situated on the northern border of Palestine, to be identical with Apamea. The similarity of sound in the two names is no doubt accountable for the identification; and it was because of this similarity that was sometimes written . But, since the latter word means also Spain, this has led to many errors.Of the tribes of the Kenites, Kenizzites, and Kadmonites (Gen. xv. 19), the rabbis said that they will belong to Israel only in the Messianic age; and R. Simon b. Yoḥai (second century) refers the lastnamed tribe to Apamea (Gen. R. xliv. 23; see "Monatsschrift," xxxix. 50). Since Apamea virtually belonged to Palestine, the first-fruits brought by Ariston from that town were accepted for sacrifice in Jerusalem (Mishnah Ḥal. iv. 11). On the outbreak of the Jewish war, the inhabitants of Apamea spared the Jews who lived in their midst, and would not suffer them to be murdered or led into captivity (Josephus, "B. J." ii. 18, § 5). The subsequent history of the Jews in this vicinity is unknown. Underthe name Fami, Efamia, the town still flourished during the Arabian middle ages; but is now a mass of ruins near Kal'at el-Medik, in the pashalic of Tarablus (Ritter, "Erdkunde," xvii. 1077 et seq.). 2. City in Phrygia, a country to which Antiochus the Great transplanted many Hebrews (Josephus, "Ant." xii. 3, § 4). By order of Flaccus, a large amount of Jewish money—nearly 100 pounds of gold—intended for the Temple in Jerusalem was confiscated in Apamea in the year 62 B.C. (Cicero, "Pro Flacco," ch. xxviii.). According to the Jewish "Sibylline Books" (i. 261), Ararat, where Noah's ark rested, was in Phrygia; and the exact spot is pointed out as the source of the great Marsyas. At this place was situated the ancient city of Celenæ, whose inhabitants were compelled by Antiochus Soter to move farther down the river, where they founded the city of Apamea (Strabo, xii. 577). Coins minted in Apamea in the third century bear the effigy of Noah and his wife, together with the word "Noah" (Reinach, "Les Monnaies Juives," p. 71, Paris, 1887). Besides the legend of Noah, the Enoch legend was also current in Apamea, as in the whole of Phrygia (Stephen of Byzantium, s.v. 'Iκόυιōυ). The two are, however, interwoven; and perhaps "Annakus" or "Nannakus," as the hero of the Enoch legend is called, is a combination of the names Noah and Enoch. The legend seems to have taken shape from the circumstance that Apamea had the additional name κιβωτός = "ark" (Ramsay, "The Cities and Bishoprics of Phrygia," I. ii. 669-672; Schürer, "Gesch." 3d ed., iii. 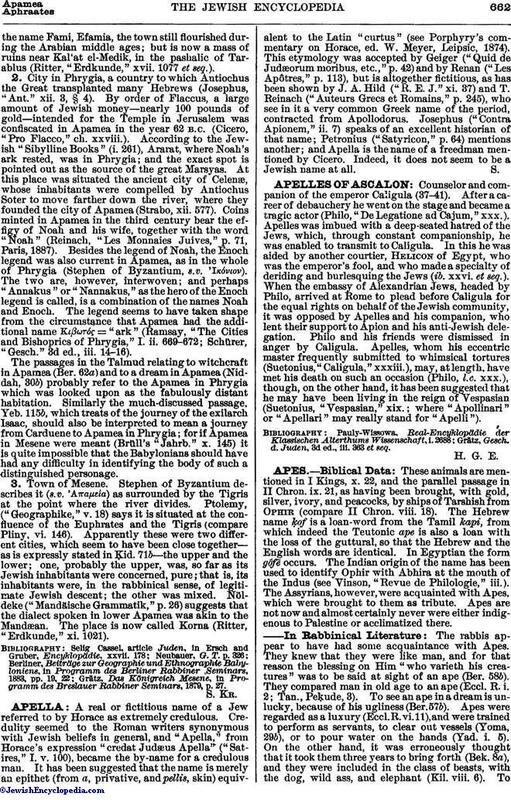 14-16).The passages in the Talmud relating to witchcraft in Apamea (Ber. 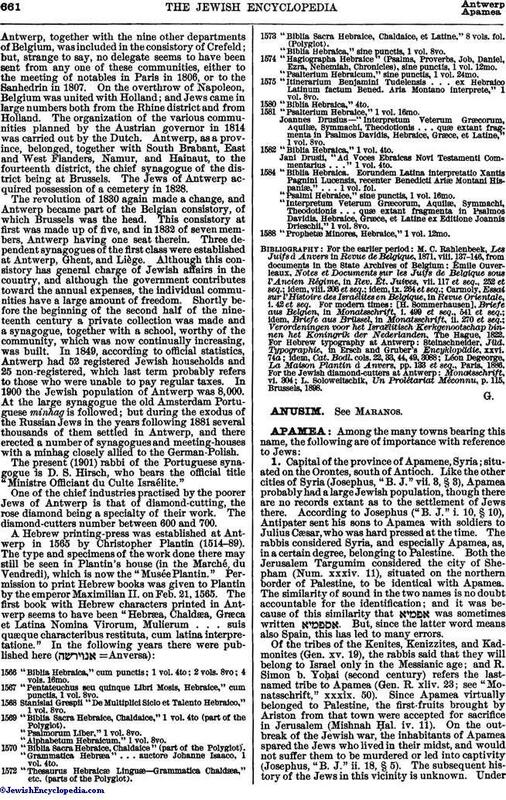 62a) and to a dream in Apamea (Niddah, 30b) probably refer to the Apamea in Phrygia which was looked upon as the fabulously distant habitation. Similarly the much-discussed passage, Yeb. 115b, which treats of the journey of the exilarch Isaac, should also be interpreted to mean a journey from Carduene to Apamea in Phrygia; for if Apamea in Mesene were meant (Brüll's "Jahrb." x. 145) it is quite impossible that the Babylonians should have had any difficulty in identifying the body of such a distinguished personage. 3. Town of Mesene. Stephen of Byzantium describes it (s.v. 'Aπαμεία) as surrounded by the Tigris at the point where the river divides. Ptolemy, ("Geographike," v. 18) says it is situated at the confluence of the Euphrates and the Tigris (compare Pliny, vi. 146). Apparently these were two different cities, which seem to have been close together—as is expressly stated in Ḳid. 71b—the upper and the lower; one, probably the upper, was, so far as its Jewish inhabitants were concerned, pure; that is, its inhabitants were, in the rabbinical sense, of legitimate Jewish descent; the other was mixed. Nöldeke ("Mandäische Grammatik," p. 26) suggests that the dialect spoken in lower Apamea was akin to the Mandæan. The place is now called Korna (Ritter, "Erdkunde," xi. 1021). Grätz. Das Königreich Mesene, in Programm des Breslauer Rabbiner Seminars, 1879, p. 27.